NOTICE: Activation key must be used on a valid Steam account. Requires internet connection.Fallout Classic Collection Fallout: A Post Nuclear Role Playing Game Fallout 2: A Post Nuclear Role Playing Game Fallout Tactics: Brotherhood of SteelAbout the gameFallout: A Post Nuclear Role Playing GameIt's the year 2161, 84 years after a two-hour-long war that destroyed most of civilization. Mankind s… oldiers on, living out a hardscrabble life on the surface or holing up in great Vaults built inside caves. You're a member of Vault 13 somewhere in Southern California, and the Vault Overseer's got a job for you: find a replacement water purification chip within 150 days, or your home is doomed.This year's Fallout® Nuclear Survival Kit uses the latest technology tkeep you alive and kicking in the event of a nuclear disaster.Fallout 2: A Post Nuclear Role Playing GameFallout 2 is the sequel tthe critically acclaimed game that took RPG'ing out of the dungeons and inta dynamic, apocalyptic retro-future.It's been 80 long years since your ancestor trod across the wastelands. As you search for the Garden of Eden Creation Kit tsave your primitive village, your path is strewn with crippling radiation, megalomaniac mutants, and a relentless stream of lies, deceit and treachery. You begin twonder if anyone really stands tgain anything from this brave new world.Fallout Tactics: Brotherhood of Steel Tactical Squad-Based Combat comes tthe Fallout® Universe with an intense multiplayer mode!You are the wretched refuse. You may be born from dirt, but we will forge you intsteel. You will learn tbend; if not you, will you break. In these dark times, the Brotherhood - your Brotherhood - is all that stands between the rekindled flame of civilization and the howling, radiated wasteland. 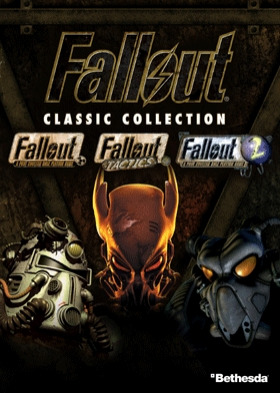 System Requirements Windows - Minimum OS: Windows 98/Me/2000/XP/Vista/Seven Pentium 400 Mhz Ram 64 Mo Hard Drive: 1,6 GB Direct-X 7-compatible videand sound cardFallout®, Fallout® 2 and Fallout® Tactics are trademarks or registered trademarks of Bethesda Softworks LLC, a ZeniMax Media company, in the U.S, and/or other countries. All Rights Reserved.